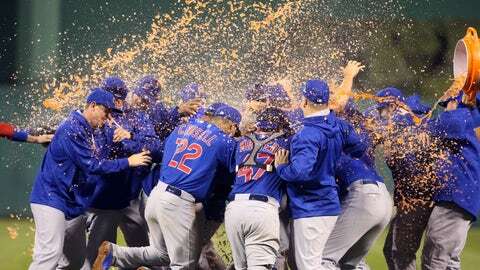 Chicago native Eddie Vedder (not pictured above) partied with the Cubs after their playoff win. When the Boston Red Sox looked to end their championship drought in 2004, they turned to an unlikely source of inspiration in the form of 28-inch-tall Nelson De La Rosa. A dozen years later, former Sox boss Theo Epstein is now looking to rewrite history with the Chicago Cubs, and they have what may be another good luck charm … Pearl Jam frontman and Chicago native Eddie Vedder. It isn’t all that common for guests to find themselves part of the clubhouse celebration following a victory — and this isn’t the first time Epstein, Vedder and the team have shared the same space. At any rate, if the Loveable Losers continue to play like they did Wednesday night, Vedder’s Cubs anthem is going to need a rewrite.